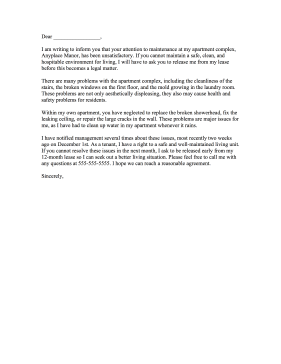 Know and maintain your tenant rights to a clean and safe environment with this complaint letter to a landlord. I am writing to inform you that your attention to maintenance at my apartment complex, Anyplace Manor, has been unsatisfactory. If you cannot maintain a safe, clean, and hospitable environment for living, I will have to ask you to release me from my lease before this becomes a legal matter. There are many problems with the apartment complex, including the cleanliness of the stairs, the broken windows on the first floor, and the mold growing in the laundry room. These problems are not only aesthetically displeasing, they also may cause health and safety problems for residents. Within my own apartment, you have neglected to replace the broken showerhead, fix the leaking ceiling, or repair the large cracks in the wall. These problems are major issues for me, as I have had to clean up water in my apartment whenever it rains. I have notified management several times about these issues, most recently two weeks ago on December 1st. As a tenant, I have a right to a safe and well-maintained living unit. If you cannot resolve these issues in the next month, I ask to be released early from my 12-month lease so I can seek out a better living situation. Please feel free to call me with any questions at 555-555-5555. I hope we can reach a reasonable agreement.